Kveik Ring (gjærkrans). Photo by Lars Marius Garshol. Diagram of types of yeast versus traditional farmhouse styles by Richard Preiss . Kveik (click here for pronunciation or here; sounds like 'kwie-ick' in English) is a dialect word for "yeast" in Norwegian ("gjær" is the common word for "yeast" in Norwegian ), and today specifically refers to non-purified yeast that has been reused for generations in traditional Norwegian farmhouse brewing. The words "kveiken", "kveika", and "kveikja" are the dialectic definite articles for the word "kveik", which all translate to English as "the kveik" . The term "kveik" does not refer to a style of beer, but only the yeast used in traditional Norwegian farmhouse brewing (Garshol has encouraged brewers brewing non-farmhouse styles with kveik to call them "X Style Beer Brewed with Kveik" or something similar ). The word "kveik" is specifically used in the western part of Norway for family-owned, non-purified yeast, while other words such as "gjester" are used by central Norwegians, "gong" is used by locals in eastern Norway, "family yeast" is used by some Lithuanian brewers, and "hemjäst" is used by locals in Gotland. The term "landrace yeast" has been proposed to refer to kveik as well as other non-kveik farmhouse yeast cultures (for example, Simonaitis) . Kveik yeast are extremely diverse genetically, presenting characteristics that are not typical in other brewing yeasts . Most farmhouse brewers have started buying their yeast, but some kveik cultures have been passed down from generations and inherited by modern farmhouse brewers in Norway who still use this yeast today and brew with traditional farmhouse methods. Much of the knowledge about kveik and historical farmhouse brewing in Norway has been researched and publicized by Lars Marius Garshol on his blog, Larsblog, and in the book Beer and Brewing Traditions in Norway by Odd Nordland (1969). In recent years kveik cultures have been sent to yeast labs for propagation and distribution to brewers around the world . The use of kveik is one of the many traditional methods still used by a few farmhouse brewers and homebrewers in Norway, along with other historical methods such as infusing the mash or boil with juniper (Juniperus communis ), not filtering, using short fermentations to achieve low carbonation, the use of wood-fired copper or iron kettles, and sometimes not boiling the wort (Raw Ale) . Kveik can also be used effectively to ferment a wide range of non-farmhouse styles, such as New England IPA and English beer styles, as well as cider, mead, and mash/wash for distillation. Farmhouse yeasts from other countries such as Lithuania and Russia have been found to be both genetically different and express different fermentation profiles than the kveik yeasts of Norway, and are therefore not referred to as "kveik". See the Farmhouse Yeasts in Other Countries page. 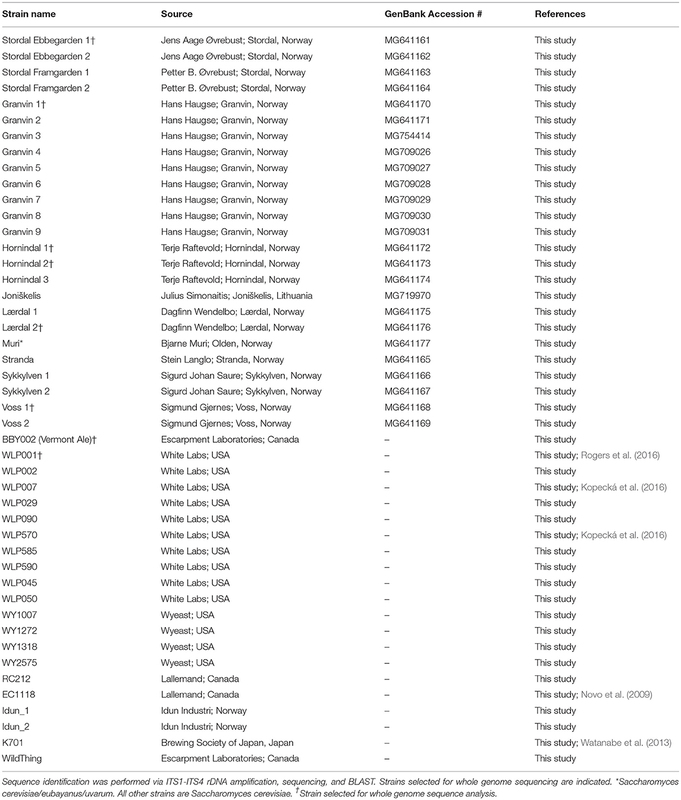 For another comprehensive list of kveik and other landrace farmhouse yeasts, see also the Farmhouse Yeast Registry maintained by Lars Garshol. Kveik was passed down from generation to generation within the family, and also shared among fellow brewers in the region. In this way, kveik evolved differently than the two major beer yeast genetic groups that are used in industrialized brewing. While mostly POF-, a trait that is selected for in many beer yeast strains that prevents the yeast from producing 4-vinylguaiacol phenol, other traits are reflective of how this yeast was used by traditional farmhouse brewers of the region. For example, as far back as 1621 (and probably prior), kveik was often stored dry on wooden logs called "kveikstokker" for up to a year or longer. Kveik was typically inoculated directly into the wort by submerging the kveikstokker into the wort at 30-40°C. The wort was often high gravity of around 1.080 SG, and the beer was served just after 1-2 days of fermentation beginning at this hot inoculation temperature. The kveik was then taken from the fermenter and dried until its next use. If the kveik went sour or died, brewers would borrow kveik from their neighbors, which was another way of preserving kveik through the centuries. Kveik was sometimes also used to ferment bread. It has been proposed by Preiss et al. (2018) that this treatment has produced yeast strains that are genetically distinct phenotypically from other domesticated yeast strains used in industrial brewing in Europe . Farmers seemed to have different preferences for top or bottom collecting their kveik for storage . Kveik was stored in many ways. It was often stored in bottles with water or in a well. It was also dried on straw rings, on linen, or pieces of wood with holes drilled through them called "yeast logs". Often ashes were used to help dry the kveik quickly, or in the case of yeast logs, were lowered into the fermentation vessel to collect the yeast and then rolled in flour and allowed to dry for a few minutes, then dipped again to repeat the process. The log was then hung to dry. Although dried kveik was said to last for months or maybe longer, fresh kveik was always preferred and often given away to those who needed new kveik (moldy kveik was thrown away) . At one time kveik was the only available form of yeast in Norway (and, of course, similar methods for reusing yeast were used all over the world prior to Emil Chr. Hansen's introduction of the pure-yeast system in 1883). However, the existence of kveik has mostly disappeared in recent times. Today kveik remains in the districts of Hardanger, Voss, Sogn, Nordfjord, and Sunnmøre, at least. Kveik is only used by homebrewers who still brew in the traditional methods of Norwegian farmhouse brewing, although the recent spreading of kveik throughout the world has led to a resurgence in its usage to make various types of beer, including non-farmhouse style beers . "Kveik" is not a beer style. Its translated meaning is "yeast". For more information, see Lars Marius Garshol's blog post "What Does 'Kveik' Mean?". If you do use kveik in a commercial beer, please consider giving the name of the original owner of the kveik on the label. This gives credit to the brewers who have donated their family heritage to the brewers of the world, and it is also helpful for those who want to know exactly which yeast was used in the beer. If you are uncertain about the name of the owner, consult the kveik registry . Since the word 'kveik" refers only to Norwegian yeasts, and there are farmhouse yeasts in other countries, the term "landrace yeast" has been proposed to refer to all farmhouse-domesticated yeast. See also Landrace Yeast and this MTF thread discussing the usage of the word "landrace" for these farmhouse yeasts. Thread in the Kveik Facebook group on why lab isolated strains are still considered "kveik". It is useful to distinguish between purified single-strain kveik, purified multi-strain kveik, and unpurified original culture . The general flavor profile of kveik yeast is ester-driven and non-phenolic, although a wide range of subtle differences can exist between strains. Kveik in its traditional form is usually a blend of closely related strains. The "Stranda" kveik was described as "lemon, nuts, grain, and straw" by Lars Marius Garshol. The "Hornindal kveik" with bacteria was described as "fruity, milky caramel, honey, and mushroom with a very unique aroma". The "Muri kveik" was described as "earthy on the nose, and fruity tasting with hints of rubber and sulfur and a thinner mouthfeel than the others" . Kveik has adapted to being fermented at relatively warm temperatures without producing off-flavors (fusel alcohols, diacetyl, or acetaldehyde), usually in the range of 30-40°C (86-104°F), but also as high as 43°C (109°F). The beer is finished fermenting within a day or two at these warmer temperatures. Årset kveik has been fermented as low as 4°C (39°F), which produced a clean and drinkable beer with a fruity aroma. They have a high alcohol tolerance of around 13-16% ABV . Omega Yeast Labs describes their two isolates (Voss and HotHead) as being non-phenolic, fruity, and complimenting American citrus hops. They also note that the yeast has a very high temperature range (~68-98°F or ~20-37°C), attenuates high, tends to flocculate well, and also tends to ferment faster at the mid to high temperature ranges, while producing similar ester profiles throughout the entire temperature range. Other kveik cultures generally produce subdued aromas below 20°C (68°F); different kveik cultures react differently at different fermentation temperatures . Pitching rates for kveik are also one of the unique things about these cultures. In general, pitching at typical ale pitching rates produce subdued esters. In order to express the yeast fermentation profile more, kveik cultures are traditionally pitched at a very low rate, perhaps somewhere around the 1-2 million cells/mL for 15-20°P wort. Brewers should experiment with the pitching rates for a given kveik strain of mixed culture, and determine which pitching rates produce desirable results. Oxygen should be at least in the 5-8 ppm range, although 10-12 ppm might be beneficial. Dried kveik cultures have a cell density of around 9-18 billion cells per gram of dried yeast (Fermentis has around 31 billion cells per gram by comparison), and so pitching as little as 10 grams of dried kveik into 100L of wort is fine. Dried kveik is generally rehydrated in first runnings for about 2-4 hours before pitching into the main batch (lautering in traditional farmhouse brewing can take a long time), with a yeast scream being traditional to ward off evil spirits. Kveik cultures are heavily dependent on nutrients, and wort that is lower than 1.050 can benefit from doubling nutrient additions . Kveik mixed cultures tend to be very flocculant, even though only about 48% of the individual strains are highly flocculant (it is thought that high flocculating strains help the lower flocculating strains to flocculate). Top-harvested kveik form a thick krausen and tends to float on top of liquid even when stored in the fridge, while bottom-harvested kveik tends to form a thin layer of krausen (see the Farmhouse yeast registry to see which kveik cultures are top vs bottom harvested; the listed harvesting method should be continued so as to continue to select for the correct strains). Harvested kveik can be stored in the refrigerator as a slurry, and survive 1-2 years (a starter should be made after about 6 months of cold storage). Attenuation ranges from 60-90% for single strains, but for mixed cultures, the attenuation is usually on the higher side . Kveik cultures make thinking about individual strains difficult because the strains are closely related and there is often not a clear distinction between strains. Richard Preiss describes kveik cultures as being "heterogenous but related communities", meaning that there can be a lot of genetic overlap between subpopulations in a kveik culture. What exactly is meant by "strain" within the context of kveik cultures has not been defined, and so discussing individual strains of kveik is an inadequate way of discussing kveik . Note regarding Granvin strains: Preiss is still trying to sort out which Granvin yeasts are duplicates and which are unique. MTF thread on dry hopping at warmer temperatures when fermenting with kveik. MTF thread on getting nail polish from some kveik cultures and where that might come from. Richard Preiss recommendations on avoiding sulfur in kveik fermentations. MTF thread by Zach Taggart on kveik producing esters similar to levels produced by kolsch yeast, and checking the accuracy of hyping kveik flavor profiles. Some of the kveik cultures that are not isolated cultures have reportedly been contaminated with lactic acid bacteria. These contaminations probably occurred during handling of the yeast at some point. See Justin Amaral's statements regarding this issue. The lactic acid bacteria found in contaminated kveik cultures can be inhibited by ~10 IBU . Traditionally, if contaminating microorganisms start having an impact on the flavor of the beer, the brewer would throw away their kveik and borrow a fresh culture from a neighbor . MTF subthread on bacterial infections in kveik. Thanks to efforts by Lars Marius Garshol and Håken Hveem, and Norwegian farmhouse brewers Svein Rivenes, Sigmund Gjernes, Bjarne Muri, Terje Raftevold, and others, kveik has been made commercially available to brewers around the world. Much of the analysis has been performed by the National Collection of Yeast Cultures (NCYC) and Escarpment Laboratories. See also the Kveik Registry being maintained by Lars Marius Garshol. Analysis has also been performed at the Norwegian University of Science and Technology (NTNU) by Truls C Rasmussen, as well as Escarpment Laboratories. MTF feedback on the NTNU analysis. Updates to the Escarpment Laboratories (Preiss et al.) analysis on MTF. and their published paper "Traditional Norwegian Kveik Are a Genetically Distinct Group of Domesticated Saccharomyces cerevisiae Brewing Yeasts". In general, most of the cultures of kveik that have been analyzed contain more than one strain of S. cerevisiae. The exact number of strains that is present in a given kveik culture is difficult to analyze; generally labs with better equipment and more time can identify more strains than others. Some kveik cultures contain multiple strains of closely related strains of S. cerevisiae, while others contain a more diverse group of strains . The kveik cultures with closely related strains defy what a "strain" isolate is; Richard Preiss describes these kveik cultures as being "heterogenous but related communities", meaning that there can be a lot of genetic overlap between subpopulations in a kveik culture and where one strain begins and another ends is not possible to define . S. cerevisiae was the only species in all of the kveik cultures analyzed by Preiss et al. (2018), except for the Muri kveik. The Muri kveik contains a single isolate of what appears to be a domestic (human produced) hybrid between S. cerevisiae, S. eubayanus, and S. uvarum. Of the 9 kveik cultures analyzed by Preiss et al. (2018), only Muri, Simonaitis, and Stranda contained only one strain of S. cerevisiae, while all of the others contained more than one strain of S. cerevisiae up to 9 strains in the case of Granvin (see this table from the paper). 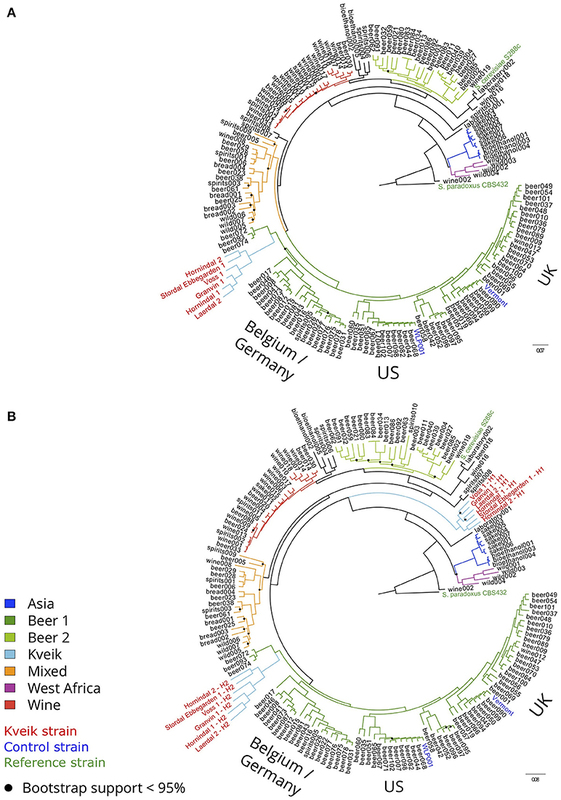 Genetically, kveik yeast strains form their own group of closely related domesticated ale strains that are a subgroup of the "Beer 1" yeasts (Belgian/Germany/UK/US yeast strains) from the Gillons/White Labs (2016) study that sequenced previously known ale strains and found them to make up two genetically related groups called "Beer 1" and "Beer 2" (see Saccharomyces History of Domestication and "A family tree for brewer's yeast" by Lars Marius Garshol). The closest related domesticated strains were 3 German hefeweizen strains, however, this relation is likely just due to both groups being hybrids rather than having any historic relation . None of the kveik strains sequenced by Preiss et al. (2018) contained the STA1 gene for diastaticus, which is expected since all of the diastaticus yeasts belong to the "Beer 2" group . Although whole genome sequencing of more kveik strains is needed in order to fully flesh out a family tree of kveik , based on the 6 strains that were analyzed, kveik strains seem to be divided into two related genetic groups, with the Muri, the Simonatis Lithuanian strain, and a Norwegian bread yeast falling outside of these two groups completely, which arguably categorizes them to not actually be considered "kveik". The two groups of kveik probably originated from two ancestors that were hybrids between a "Beer 1" yeast and wild yeast. Interestingly, the kveik cultures that have multiple strains have strains from both genetic groups of kveik. For example, Hornindal, Granvin, Laerdal, and Stordal Ebbergarden all contained strains from both genetic groups of kveik. Overall, their genetic diversity is wider than the genetic diversity of other "Beer 1" subgroups . See this updated family diagram of yeast. Preiss et al. (2018) also measured the fermentation characteristics of individual kveik strains in their study, the first published data in this regard for kveik. At 86°F (30°C) they found that 11 of the 24 pure strains of kveik outperformed the best control strain (WLP002) in fermentation rate. There was still a very wide range of attenuation rates between the kveik strains (60-90%). Of the 6 strains that had their DNA sequenced, all but one of the Granvin strains fermented maltotriose. All of the strains tested were POF- (meaning they did not produce significant 4-vinylguaiacol phenol) except the Muri strain which is not genetically related to kveik. One of these Stordal Ebbegarden strains also contained a unique mutation on the FDC1 gene that results in the inability to produce phenols and has not been reported before in science. They also found that kveik strains tend to produce fatty acid esters at levels that are typical for other domesticated yeast strains, such as ethyl caproate (pineapple, tropical; threshold 0.21 ppm), ethyl caprylate (tropical, apple, cognac; threshold 0.9 ppm), and ethyl decanoate (apple; threshold 0.2 ppm). The kveik strains studied did not produce high levels of the isoamyl acetate ester (banana) and generally lower levels of the fusel alcohol isobutanol compared WLP001 and WLP002. Strangely, 5 of the 6 strains that were analyzed could form spores, which is not typical for brewers yeast . The kveik strains studied by Preiss et al. (2018) displayed unique abilities as far as withstanding stress in their environment. Most of the strains at least doubled their growth at 43°C and grew to their maximum potential at 40°C, while the control strains WLP001, WLP002, and WLP029 showed limited growth at those temperatures. This demonstrates kveik's ability to withstand high-temperature fermentations. All strains tested died at 45°C . Kveik strains were also demonstrated by Preiss et al. (2018) to have a higher tolerance to alcohol than some of the domesticated strains tested (WLP001, WLP002, and WLP029), as well as unique flocculation characteristics. Most of the kveik strains doubled in growth in media with 14% ABV ethanol, and about half of them doubled in growth in 16% ABV ethanol media. Half of the strains of kveik were highly flocculant, but some other strains were very poor flocculators. It is possible that since kveik is a mixed culture of several strains of yeast that the highly flocculant strains assist the others in flocculation thus diminishing for the other strains to evolve flocculation properties . "Where kveik comes from", an analysis of the Preiss et al. study by Lars Marius Garshol. MTF thread post by Richard Preiss summarizing the study's findings. Omega Yeast Labs as "Voss Kveik" OYL-061 (homebrew and commercial pitches). The Yeast Bay Sigmund's Voss Kveik. Escarpment Labs offers a single isolate from Voss kveik. Sleight Beer Lab offers one strain isolated from the Sigmund Gjernes kveik that they call "Gebo". Propagate Lab also offers one of the single isolates from Sigmund's kveik. It is suspected that the Imperial Organic Yeast Loki is a single strain from Sigmund kveik, but this is unconfirmed . The full culture with all strains is available from Mainiacal Yeast. Tips from Andrew Rathband and Lars Garshol on MTF. Ryan Brews Blog; Norwegian Table Beer review using The Yeast Bay's Voss Kveik. See also the Saccharomyces page for vendor tips. Richard Preiss recommends that Voss Kveik can go as high as 13% ABV, but also needs high nitrogen nutrients (especially for a wine fermentation) . Tips for using kveik in hoppy beers. Brewer Svein Rivenes deposited a sample of kveik in 2009 via Håken Hveem. No bacterial contamination was found . Seven strains were isolated from the blend. NCYC 3545 - original sample of kveik containing seven strains of S. cerevisiae. NCYC 3546 - 1st isolate in the 3545 blend. NCYC 3547 - 2nd isolate in the 3545 blend. NCYC 3548 - 3rd isolate in the 3545 blend. NCYC 3549 - 4th isolate in the 3545 blend. NCYC 3550 - 5th isolate in the 3545 blend. NCYC 3551 - 6th isolate in the 3545 blend. NCYC 3552 - 7th isolate in the 3545 blend. Martin Warren collected a sample from brewer John Nornes in Voss in 2015. The kveik has been analyzed by NCYC, but the strains have not been assigned numbers yet. Also available from Omega Yeast Labs as "HotHead Ale" OYL-057. Terje's kveik was mixed with 2-3 other kveiks. This probably explains the wider variety of isolated strains. It also contains bacteria, and these bacteria seem to be contributing positively to the aroma (and they don't sour the beer). See "Kveik testing" and "Hornindal: interviews and collecting kveik" on Larsblog for more information. NCYC 4051 - the original sample of kveik containing eight strains of S. cerevisiae. NCYC 4058 - 1st isolate in the 4051 blend. NCYC 4060 - 2nd isolate in the 4051 blend. NCYC 4063 - 3rd isolate in the 4051 blend. NCYC 4064 - 4th isolate in the 4051 blend. NCYC 4067 - 5th isolate in the 4051 blend. NCYC 4068 - 6th isolate in the 4051 blend. NCYC 4069 - 7th isolate in the 4051 blend. NCYC 4070 - 8th isolate in the 4051 blend. Two strains are packaged together as a blend by Escarpment Laboratories as their Hornindal Kveik Blend. Mainiacal Yeast Labs (contains lactic acid bacteria from the original sample) and Omega Yeast Labs (does not contain lactic acid bacteria)  sell the native blend. This is the kveik Terje Raftevold's kveik branched off from in the 1990s. Olav says he has mixed it with other kveiks 1-2 times in the meantime. It was collected for comparison purposes. Little is known about this kveik, but it is described in Rasmussen's thesis. From Samuel Lien in Grodås, Hornindal. Collected by William Holden. Samuel got the kveik from Hans Øen, who moved from Hornindal from Faleide in Stryn, so the yeast is originally from Stryn. Øen is dead, but Lien is alive. Pitch temperature 30. Lars Marius Garshol collected this from Lars Andreas at the Kornøl Festival. More information needed. Arvid Solheim collected this kveik from Dagfinn Wendelbo at Ljøsne in Lærdal. Wendelbo lost his own kveik a couple of years ago, and got this from Per Gjermann. As far as I understand it originates with Gjermann, from the farm Stødno in Lærdal. Originates from Hans Haugse from Granvin, Hardanger, via Einar Vestrheim and Lars Olav Muren. NCYC analysis indicates that it contains both Pichia and Saccharomyces. Commercially available from Mainiacal Yeast. Originates with brewer Sigurd Johan Saure, at Tormodgarden in Aurdal in Sykkylven. Sigurd says the yeast has definitely been reused since his great-great-grandfather's time. His great-grandfather mixed it with another yeast from a friend in the 1950s, after the yeast "got weak". Collected, but not sent to the NCYC yet. This kveik comes from Jens Aage Øvrebust, and was collected by William Holden. Jens originally brewed raw ale, but started boiling the wort because his beer became sour now and then. Pitch at 28C, harvest yeast from the top after a couple of days. Prefers not to let the yeast go over 30. Usually ferments 4-6 days. Sent to NCYC and NTNU, but no results yet. Jens usually ferments down to an SG of 1010, because he doesn't want the beer sweet. He says the yeast has always been in the valley as far as he knows. Appears to have an unusual relationship with hops, so beware that this yeast may accentuate the hop bitterness in your beers. Jens says he only dry-hops himself. Richard Preiss from Escarpment Laboratories reported that sensory data on how bitter beer tastes with Ebbegarden kveik versus other yeast strains (Hornindal kveik and Conan strain) is that it produces a slightly more bitter beer, but the effect is not big . One strain from this kveik is available from Sleight Beer Lab; product named "Whwaz Nordic". Escparment Laboratories sells the complete blend as sourced by Jens Aage Øvrebust. From Petter B Øvrebust at a neighbouring farm in Stordal. Collected by William Holden. Petter still brews raw ale, pitches at 30C, ferments 2-3 days. Commercially available from Mainiacal Yeast. One isolated strain is available from Sleight Beer Lab; product "Fehu Nordic". From Odd H Midtbust at a third farm in Stordal, collected by Lars Marius Garshol. Jens Aage Øvrebust says this yeast is pitched at 33C, and that it should be kept at this temperature during fermentation. Usually ferments about 3 days. Midtbust harvests the yeast from the top. Jarle brought this kveik to the Kornøl Festival, where he gave it to Lars Marius Garshol. Jarle originally got the yeast from Tore Hjelle in Eidsdal in 1979-1980, so the yeast comes from Eidsdal. Jarle has kept the yeast ever since, and he says "I've watched it like gold." Jarle pitches at 31 degrees, and doesn't want the fermentation to go above 36 degrees. He ferments roughly 30 hours. Jakob brought this kveik to the Kornøl Festival, where he gave it to Lars Marius Garshol. More information needed. Escparment Laboratories sells the complete blend as sourced by Jakob Årset, on the farm Årset in Eidsdal, Norway. The overall flavour profile is similar to the Hornindal Kveik Blend, but this blend exhibits a broad temperature range (we have heard of sub-15ºC) and tolerates acidic wort quite well. Attenuation: 70-80% // Optimum Temp: 20-37ºC // Alcohol tolerance: Very High // Flocculation: High. Jakob Eitrheim, born 1920, has been using this kveik in Bleie since the 1950s. He says he got it from his grandfather, who lived at Eitrheim (now part of the town of Odda), but he doesn't know where it came from before that. So he claims to know the history of the yeast back to the late 19th century. Jacob ran out of yeast in the late 1950s, and got new yeast from his brother, who had the same kveik. The yeast is pitched at 37C, and harvested from the bottom. The Eitrheim family dry it and keep it in glasses. They usually ferment 3-4 days. Commercially available from Mainiacal Yeast Labs . This is a summary of commercially available kveik cultures. See the above descriptions, the kveik registry, and the vendor's website for more information about the cultures. Most are single strain isolates, while some contain multiple strains or the native "unpurified" mixed cultures (this will be denoted in the Notes column). Note that strain information can be misleading because kveik cultures make talking about individual strains difficult due to the strains being closely related yet diverse. Richard Preiss describes kveik cultures as being "heterogenous but related communities", meaning that there can be a lot of genetic overlap between subpopulations in a kveik culture and where one strain begins and another ends has yet to be defined (see Recent Lab Analysis above) . Commercially available non-kveik landrace farmhouse yeast are listed on the Landrace Yeast page. Sigmund Gjernes's Voss 1 Omega Yeast Labs Voss Kveik OYL-061 Single strain isolate. Omega Yeast Labs and The Yeast Bay independently isolated one of the strains from the Voss Kveik. It is not known if these are the same strains, or which NCYC strain they correspond to. However, they are thought to be similar in their flavor profile. Sigmund Gjernes's Voss 1 The Yeast Bay SIGMUND'S VOSS KVEIK Single strain isolate. Omega Yeast Labs and The Yeast Bay independently isolated one of the strains from the Voss Kveik. It is not known if these are the same strains, or which NCYC strain they correspond to. However, they are thought to be similar in their flavor profile. Sigmund Gjernes's Voss 1 Mainiacal Yeast The full, unpurified (no microbes isolated or removed) culture. Limited availability. Sigmund Gjernes's Voss 1 Escarpment Laboratories Voss Kveik Single strain isolate. Sigmund Gjernes's Voss 1 Sleight Beer Lab Gebo Nordic Yeast Pitch Single strain isolate; sold dried. Sigmund Gjernes's Voss 1 Imperial Organic Yeast Loki A single strain isolate of kveik that is suspected to be from Sigmund's kveik, but the source is unconfirmed. Sigmund Gjernes's Voss 1 East Coast Yeast ECY43 Nordic Farmhouse Single strain isolate. Sigmund Gjernes's Voss 1 Fermentum Mobile (Poland) FM53 Voss kveik Single strain isolate. Sigmund Gjernes's Voss 1 Propagate Lab MIP-340 Voss Kveik Isolate Single strain isolate. Stein Langlo's Stranda 3 Omega Yeast Labs HotHead Ale OYL-057 Single strain isolate (only one strain was revived by NCYC). Stein Langlo's Stranda 3 Mainiacal Yeast Dried Kveik - Stranda The full, unpurified (no microbes isolated or removed) culture. Limited availability. Muri 4 Mainiacal Yeast Dried Kveik - Muri The full, unpurified (no microbes isolated or removed) culture. Limited availability. Terje Raftevold's Hornindal 5 Escarpment Laboratories Hornindal Kveik Blend Two strains isolated from the original culture. Terje Raftevold's Hornindal 5 Mainiacal Yeast The full, unpurified (no microbes isolated or removed) culture; contains lactic acid bacteria. Limited availability. Terje Raftevold's Hornindal 5 Omega Yeast Labs Hornindal Kveik Original culture, but "purified" to remove the lactic acid bacteria. Terje Raftevold's Hornindal 5 Propagate Lab MIP-342 Kveik Hornindal The full, unpurified (no microbes isolated or removed) culture. Lærdal 6 Mainiacal Yeast Dried Kveik - Laerdal The full, unpurified (no microbes isolated or removed) culture; contains lactic acid bacteria. Sold dried. Limited availability. Hans Haugse's Granvin 7 Mainiacal Yeast The full, unpurified (no microbes isolated or removed) culture. Limited availability. Ebbegarden, Stordal 9 Sleight Beer Lab Whwaz Nordic Single strain isolate; sold dried. Ebbegarden, Stordal 9 Escarpment Laboratories Ebbegarden Kveik Blend Two strains isolated from Ebbegarden . Ebbegarden, Stordal 9 Mainiacal Yeast Dried Kveik - Ebbegarden The full, unpurified (no microbes isolated or removed) culture. Limited availability. Framgarden, Stordal 10 Mainiacal Yeast The full, unpurified (no microbes isolated or removed) culture. Limited availability. Framgarden, Stordal 10 Sleight Beer Lab Fehu Nordic Single strain isolate. Lida 11 Mainiacal Yeast Dried Kveik - Lida The full, unpurified (no microbes isolated or removed) culture with a strain of Lactobacillus. Limited availability. Årset 13 Mainiacal Yeast Dried Kveik - Årset The full, unpurified (no microbes isolated or removed) culture. Limited availability. Årset 13 Escarpment Laboratories Årset Kveik Blend Contains multiple inter-related strains; see this explanation from Richard Preiss. Nornes 15 Mainiacal Yeast Dried Kveik - Nornes The full, unpurified (no microbes isolated or removed) culture. Limited availability. Midtbust, Stordal 17 Mainiacal Yeast Dried Kveik - Lida The full, unpurified (no microbes isolated or removed) culture. Limited availability. Nystein 19 Mainiacal Yeast Dried Kveik - Nystein The full, unpurified (no microbes isolated or removed) culture. Limited availability. Tomasgard 21 Mainiacal Yeast Dried Kveik - Tomasgard The full, unpurified (no microbes isolated or removed) culture, including a hop tolerant Lactobacillus. Limited availability. Wollsæter 35 Mainiacal Yeast The full, unpurified (no microbes isolated or removed) culture. Limited availability. Aurland 38 Propagate Lab MIP-341 Kveik Auland The full, unpurified (no microbes isolated or removed) culture. May contain bacteria. Skare 41 Mainiacal Yeast Dried Kveik - Skare The full, unpurified (no microbes isolated or removed) culture. Limited availability. Opshaug 43 Mainiacal Yeast Dried Kveik - Opshaug The full, unpurified (no microbes isolated or removed) culture. Limited availability. Opshaug 43 White Labs (Vault) WLP518 Single strain isolate . Unknown Bootleg Biology OSLO Single strain isolate. Isolated from Eld & Tid's house culture which is a mix of kveik cultures . Unknown Bootleg Biology AURORA Single strain isolate. Isolated from one of the kveik cultures from Hornindal (the specific Hornindal kveik culture is unknown to Bootleg Biology) . There are farmhouse yeasts in other countries that have survived for generations, similar to kveik, but are genetically distinct from kveik. Since the term "kveik" refers to just Norwegian farmhouse yeast, the term "landrace yeast" has been proposed to refer to farmhouse yeasts as a category of yeast. Non-kveik landrace yeast includes yeasts from Lithuania and Russia include Simonaitis, Rima, and Jovaru Alus. See Landrace Yeast for more information. Interview with Lars Garshol Part 1 and Part 2. A family tree of kveik - Summary of Richard Preiss and Carolina Tyrawa's genetic research on kveik strains. Analysis of farmhouse yeast (kveik) - overview of master thesis by Truls C. Rasmussen that characterizes several kveik yeast species/strains. Kveik: Norwegian farmhouse yeast - An introduction to kveik and an initial report of DNA analysis by NCYC from 2009. Kveik analysis report - 2014 DNA fingerprinting of two more kveik samples sent to NCYC; one sample could not grow in the lab. The other found three closely related strains of yeast and no bacterial infection (Sigmund Gjernes's Voss Kveik). Brewing with kveik - Sigmund Gjernes, a homebrewer in Norway, brews traditional Norwegian farmhouse ale with kveik. Hornindal: interviews and collecting kveik - An attempt by Lars to collect three more samples of kveik which would not grow in the lab. Kveik testing - Lars brews using 5 different samples of kveik he's collected, and compares tasting notes. Raw ale - Definition of "raw ale", and the methods used to brew it in historical and traditional farmhouse brewing. My book on Norwegian farmhouse ale - Garshol's book on kveik and Norwegian farmhouse ale (currently available in Norwegian only). Norwegian farmhouse ale styles - An overview of the different styles of Norwegian farmhouse ale. Norwegian farmhouse ale - A brief history of traditional Norwegian farmhouse brewing (Lars refers to it as "homebrewing"), and what it is like today. Norwegian Ethnological Research - Garshol's own research of the data that formed the basis for the definitive book on Norwegian farmhouse ale, Odd Nordland's "Brewing and beer traditions in Norway," published in 1969. Herbs in Norwegian farmhouse ale - Survey analysis of herbs used in traditional Norwegian farmhouse ale. Norway: climate and ingredients - Survey analysis of the distribution of brewing malts in traditional Norwegian farmhouse ale. MTF thread on species of juniper to use for farmhouse styles beers, and which are poisonous. Traditional farmhouse brewer, maltster, and Gotlandsdricke from Gotland. For farmhouse yeast in other countries, see In Other Countries above. "How to Brew Keptinis", a Lithuanian style of farmhouse ale using baked bread our of mash grains. See also this MTF thread on experiences of MTF members brewing this style of beer. Brewing Pilsner-like styles with good clarity. NEIPA with Voss Kveik, including an attenuation graph. Finding traditional farmhouse ale made commercially, and commercial beers that conflate tradition. Fermenting at colder temperatures, including lager temperatures. Kveikstokk with yeast slurry on it. Images provided by Antonio Golia ("Homebrew Condor"). As Norwegian farmhouse brewers only brew 2-3 times per year, kveik has adapted to being dried and stored for long periods of time in-between usage, which is unique among most domesticated yeast . Wooden carvings are used to store dried kveik. Their use is simple: drag the kveik ring/kveikstokk through the krausen of a fermenting beer, and then hang the ring/kveikstokk to dry. On the next batch, the ring/kveikstokk is dunked into wort to reactivate the yeast . Note that not all yeast reacts well to drying. Kveik has this exceptional ability. For example, Brettanomyces is known to not be tolerant of drying/desiccation . Dried kveik should be stored in the freezer, and has been known to last at least 20 years in this way. Frozen, dried kveik should be thawed and simply added to a liter or so of ~30°C (86°F) wort for 2-4 hours before adding that to the main batch of wort . Tim Oelke of Suds n' Sawdust offers kveik rings in the US for sale. Craft Labs in Sweden offers kveik rings off and on; contact info at craftlabs dot se. MTF thread on building a kveik ring. MTF thread with images of using a kveikstokk. MTF thread on drying kveik on parchment paper. See also this post by Matt Spaanem on drying yeast (including some wild yeast strains) on parchment paper. MTF thread on successfully drying Omega Yeast Lab's Hornindal kveik using a dehydrator. Bryan Heit's drying instructions using a jerky dehydrator and viability testing of dried kveik. See also Part 2, measuring viability of dried kveik after one month. Poppyland Brewer instructions on how to build a kveik ring. Instructions on building a kveik ring and history information by George Hart. "Brewing with kveik" by Lars Garshol, with an example of using a yeast ring. "Kveik: Norwegian farmhouse yeast" by Lars Garshol, with images of ancient kveikstokk. MTF thread on an old kveik ring from Vågå that was sent to hopefully revive the old dried kveik on the ring. Matt Spaanem's blog post on using a smaller kveikstokk for a wild caught yeast culture. Antonio Golia's write up on making and using a kveikstokk (in Italian; use an online translator). List of videos maintained by William Holden in the Kveik Facebook group. Ivar A. Geithung's historic family farmhouse (Vasstrond'e Småbryggjarlaug). Terje Raftevold in Hornindal brewing raw farmhouse ale with kveik. MTF thread on Lars Garshol sending Richard Preiss several strains of kveik for isolation and analysis. MTF thread on Alcolyzer readings (original gravity, final gravity, and ABV) of various farmhouse ales taken at Norsk Kornølfestival 2017. See also this spreadsheet. Beer and Brewing Traditions in Norway by Odd Nordland, Universitetsforlaget, 1969. Gårdsøl - det norske ølet by Lars Marius Garshol, Cappelen Damm, 2016. More info. "Making a yeast ring", Poppyland Brewer blog. See also these instructions. "Lithuanian Countryside Yeast Tales," by ramtyns, 2012. Short History of Beer in Lithuanian, by Alastair Philip Wiper. "Characterization of genotype and beer fermentation properties of Norwegian Farmhouse Ale Yeasts," masters thesis by Truls C. Rasmussen. "Chain letters for Kveik" and Kveik flavor profiles. Kveik yeast pitching rates discussion on MTF. Norwegian brewer Ivar A. Geithung discusses his brewing process with kveik yeast on MTF. Sui Generis Blog on using Kveik for a black IPA recipe. "Kveik World Order" blog, by DeWayne Schaaf. Tony Yates video playlist on YouTube on brewing traditional Norwegian farmhouse ale with various Kveik yeast strains. Presentation notes and slides from a Lars Garshol presentation, by Ed Wray, 2018. Kveik Buy/Sell Group on Facebook. MBAA podcast interview with Richard Preiss of Escarpment Labs on Kveik. "How to Brew with Kveik" by Lars Marius Garshol and Richrad Preiss; MBAA TQ Quarterly (MBAA member access only). ↑ 1.0 1.1 Richard Preiss. Milk The Funk Facebook group thread on kveik. 06/19/2018. ↑ Bab.la Dictionary. Retrieved 01/21/2016. ↑ Sveinung Marvik and Lars Marius Garshol. Kveik Facebook group. 01/03/2018. ↑ 4.0 4.1 4.2 Lars Marius Garshol. Milk The Funk Facebook group reply on the meaning of the word "kveik". 12/29/2016. ↑ "Kveik" - what does it mean?. Lars Garshol. Larsblog. 10/29/2017. Retrieved 10/29/2017. ↑ "Analysis of farmhouse yeast (kveik)." Larsblog. Lars Marius Garshol. 09/06/2016. Retrieved 09/06/2016. ↑ 7.0 7.1 7.2 Kveik: Norwegian farmhouse yeast. Larsblog. 11/07/2013. Retrieved 01/14/2016. ↑ Lars Marius Garshol. "The juniper mystery". Larsblog blog. 02/02/2017. Retrieved 12/13/2018. ↑ Maltøl, or Norwegian farmhouse ale. Larsblog. 10/11/2016. Retrieved 01/14/2016. ↑ 10.0 10.1 10.2 10.3 10.4 10.5 Traditional Norwegian Kveik Are a Genetically Distinct Group of Domesticated Saccharomyces cerevisiae Brewing Yeasts. Richard Preiss, Caroline Tyrawa, George van der Merwe, Kristoffer Krogerus, Lars Marius Garshol. 2018. ↑ Norwegian farmhouse ale. Larsblog. 10/27/2013. Retrieved 01/14/2016. ↑ 12.0 12.1 12.2 12.3 12.4 12.5 12.6 12.7 12.8 12.9 How to Brew with Kveik. Lars Marius Garshol and Richard Preiss. MBAA Technical Quarterly, 2018 Q4. ↑ Lars Marius Garshol. Kveik facebook group thread on kveik terminology. 11/03/2018. ↑ 15.0 15.1 15.2 "Kveik testing". Larsblog. 05/05/2014. Retrieved 01/20/2016. ↑ 16.0 16.1 16.2 Richard Preiss and Lars Garshol. Milk The Funk post about the subtle differences in strains in some kveik cultures. 04/04/2019. ↑ Sensory data on kveik strains shared by Richard Preiss on MTF. 09/15/2016. ↑ Justin Amaral. Milk The Funk Facebook group thread about lactic acid bacteria in kveik cultures and sensitivity to IBU. 06/05/2018. ↑ Richard Preiss. Milk The Funk Facebook thread on kveik and the STA1 gene. 01/03/2018. ↑ Richard Preiss. Milk The Funk Facebook group comment about the two families of kveik yeast. 09/13/2018. ↑ Analysis of Sigmund Gjernes Voss yeast sample for Lars Marius Garshol, RÆLINGEN NORWAY. September 2014. Retrieved 01/20/2016. ↑ Conversation with Lance Shaner and Lars Marius Garshol on MTF. 01/04/2016. ↑ Lars Marius Garshol. Milk The Funk Facebook group thread on Imperial Organic Loki. 10/31/2018. ↑ Lars Marius Garshol and Richard Preiss on Voss alcohol tolerance. Milk The Funk Facebook group. 08/04/2017. ↑ Private correspondence with Adi Hastings of Omega Yeast Labs by Dan Pixley. 03/27/2018. ↑ Richard Preiss. Milk The Funk Facebook group thread on the bitterness produced by Ebbegarden kveik. 12/04/2018. ↑ Justin Amaral. Milk The Funk Facebook group post about Mainiacal Yeast kveik. 08/21/2018. ↑ Private correspondence with Inland Island sales staff by Dan Pixley. 04/05/2019. ↑ Private correspondence with Texas Cultures Laboratories sales staff by Dan Pixley. 04/05/2019. ↑ Chris Saunders. Milk The Funk Facebook post on Escarpment Labs Ebbegarden. 04/04/2019. ↑ Allen Stone. Image of a White Labs poster. 04/14/2019. ↑ 32.0 32.1 Jeff Mello. Personal correspondence with Dan Pixley. 03/07/2019. ↑ Lars Marius garshol. Milk The Funk Facebook group post about using a kveik ring. 2017. ↑ Justin Amaral. Milk The Funk Facebook group post on kveikstokk and drying Brettanomyces. 08/16/2018.